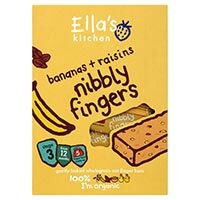 Our yummy Nibbly Fingers are perfect finger foods for babies and toddlers. Nibbly Fingers snack bars are packed with organic fruits, veggies + whole grain oats without the tiniest smidge of concentrates or refined sugars. They’re the perfect size for toddlers’ hands + tummies, and come in handy, individually wrapped bars so little nibblers can enjoy them on the go!